The Aker leather 588 XTS3000 is the same as 588U, but designed specifically made to fit Motorola XTS3000 Radio. 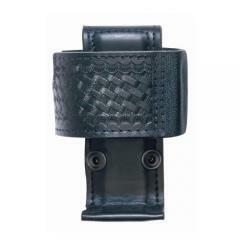 It snaps onto standard Sam Browne belts up to 2-1/4 inches. The upper strap is lined with Velcroo® closure and can be adjusted to accept virtually any hand-held radio. Features a steel reinforced base support.